We’re trying something new today with our weekly Throwback Thursday feature — we’ve looked up what was happening in the pages of the News Journal 50 years ago on Thursday, Jan. 16, 1969. “PARIS — The long-stalled Paris peace talks are to begin Saturday, eight months after the preliminary discussions got underway. “LEES CREEK — The East Clinton Board of Education, at the request of the Department of Industrial Relations, Division of Factories and Buildings, will officially close the Reesville elementary school Monday, Jan. 27. WILMINGTON — American Legion Post 49 started their 1969 community service as Commander Floyd Carnahan presented an “outside flag” to Sherrill Smith, superintendent of the Clinton County Children’s Home. 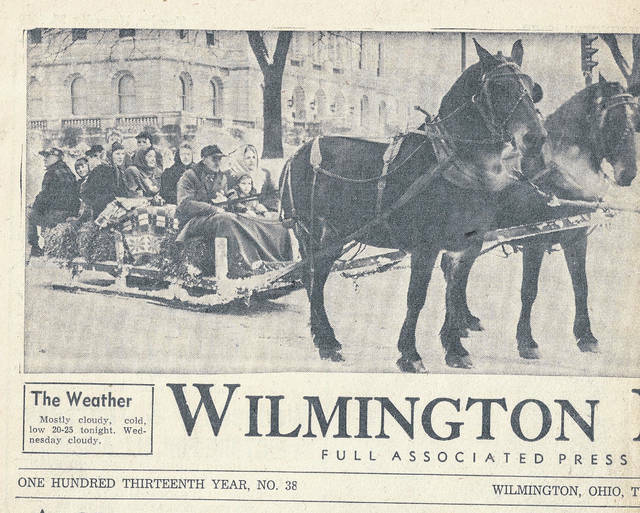 Bessie Howell, 87, Wilmington; Walter Haines, 83, Wilmington; Minnie Van Tress, 91, Jamestown. Burger Chef at 860 Rombach Ave. offered 2 Big Shef sandwiches for 79 cents (regularly 45 cents each). Frisch’s Big Boy on Rombach Ave had a “Basketball Special”: Brawny Lad Chopped Steak Sandwich plus chocolate or coconut cream pie and 15-cent drink all for 89 cents. Blan Bargain Barn had Norge ranges from $139, half-slips for 48 cents, and a portable black-and-white TV for $89. A&P market at the corner of Sugartree and Lincoln Streets had apples 10 for 79 cents and a 1-lb. box of saltine crackers for 25 cents. Donahue’s Super “E” market at 110 S. South St. had yams for 10 cents a pound and Budget Buy 50-lb. bag of potatoes for $1.59.